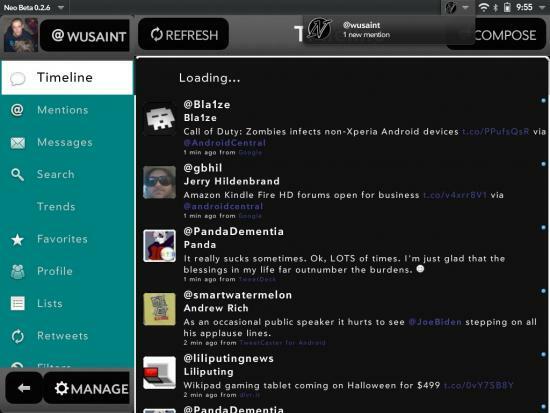 The land of webOS used to be a bountiful land full of ridiculously awesome Twitter apps. As time progressed interest in webOS amongst developers dwindled and these developers either pulled their app or abandoned them altogether. Then when former CEO extraordinaire </sarcasm> Leo Apotheker killed webOS hardware the Twitter apps started dropping like flies. We still have a couple great offerings from diehard webOS developers, but the overall selection is definitely "slim pickens" compared to what webOS users once had. 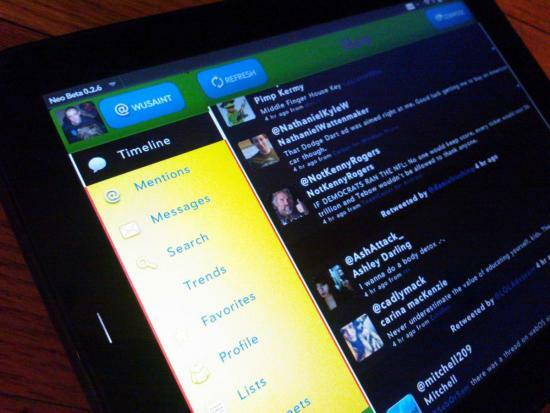 Needless to say we are always happy to see any signs of a new Twitter client (or any new app, really) so when we stumbled upon Neo webOS we got excited. Since the app is currently in closed beta, we immediately got in touch with the developer and managed to snag a very early copy of the app to preview for you. Neo webOS is the brainchild of developer Bryan Leasot, otherwise known as @fxspec06 on the interwebs, and a student of Computer Information Systems Programming. Leasot planned this project all summer long and as soon as his summer classes ended in early August he got started on Neo with a little help from his friend Jake Morrison. 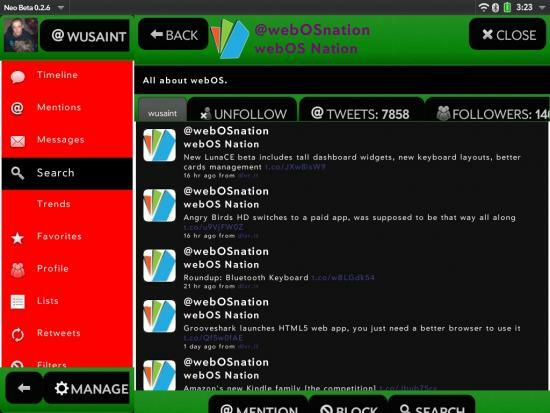 Using Spazcore from the open source and famed open source webOS Twitter client Spaz HD as a foundation, Leasot gutted and rewrote code from Spaz HD with the new Enyo 2.0 framework. His current goals for this project are speed, customizability, and usability. Stressing Leasot's goal of customization, a user will be able to change almost every aspect of the appearance within Neo to their liking. As Leasot so graciously points out to us "You don’t like the colors? Change them. You don’t like the “Twitter standard” layout? Change it. You don’t like the borders or buttons? You can’t read some text somewhere? No problem – you can change that too. Some apps have themes, but none to my knowledge allow customization as deep as Neo." Beyond the amazing customization that is possible with Neo one can also expect the usual suspects in the way of options. Neo includes multiple account support, notifications, trends, favorites, etc. So Neo users will not have to compromise any features for its lighjtweight and speedy design. As stated earlier, this app is currently a very early beta so it is a little rough around the edges. In its current state it tends to be a bit laggy and needs some polish in the user interface department, but all the makings of a great Twitter app are in place. We also noticed that some things like the settings menu are rather un-webOS like. Instead of placing these settings in the top left drop down like most apps it opts for a big "Manage" button at the lower left of the app. This is not necessarily wrong, but it feels strange to have the settings there instead of where it is usually located in a webOS app. However, Leasot may push this app onto other platforms in the future, so putting the settings in a place like that would guarantee uniformity regardless of platform. In the end we like what we see so far in Neo and are looking forward to the app's final release in the near future. With a little hard work this app could really shine and be a top contender in the App Catalog. Despite Neo's current beta state Bryan plans to have it in the App Catalog in a few weeks for $4.99. To quote our dear friend Phillip J. Fry: "Shut up and take my money!"